I know that prepackaged, boxed stuffing makes a major appearance during Thanksgiving. Part of me completely understands – I mean Thanksgiving is the craziest of all cooking days with the oven doing quadruple duty and a little shortcut here and there never hurts. But the other part of me is hoping I can change the trend and bring homemade stuffing back to the Thanksgiving table. I tried homemade stuffing for the first time four years ago. And I can never go back. There is absolutely no comparison between homemade stuffing and the other “stuff”ing. The flavor is fresh, unprocessed and completely delicious. In my house we prefer stuffing to be a bit on the chewy, crunchy side of things. No soggy bread for me, thank you very much. The dreamy thing about this recipe is you can have it however you like – soft and dare I say, mushy…or firm and tender. Either way, this is the best stuffing I’ve ever had. 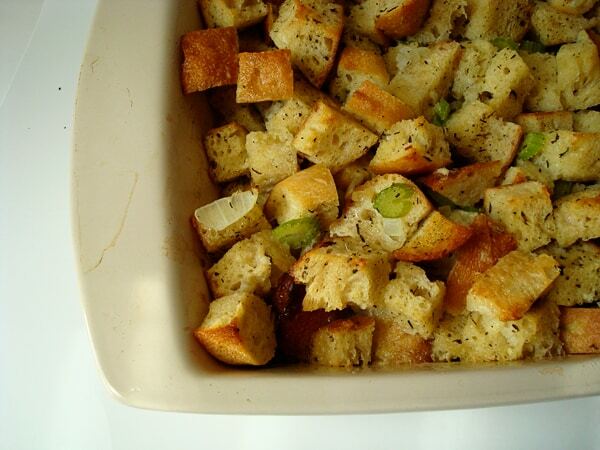 When I make this stuffing, I always toast the bread in the oven the night before. I also chop up all the vegetables and cook them the night before, refrigerating after they are cooled. Finally, I combine the seasonings in one small bowl. The day of, I can throw everything together and bake it quickly. Preheat the oven to 350°. Melt 5 tablespoons butter in the microwave. Toss with bread cubes in a large bowl. Spread in a single layer on 1 or 2 rimmed baking sheets. Toast in the oven, tossing once, until golden, about 20 minutes. Let cool completely. Heat the oil and remaining 2 tablespoons butter in a large skillet over medium-high heat until butter has melted. Add celery, onions, garlic, and a pinch of salt; cook, stirring occasionally, until golden brown and soft, about 10 minutes. To bake all of the stuffing in the oven: (this is my preferred method) Put vegetable mixture and toasted bread into large bowl. Stir in poultry seasoning, herbs, and 2 cups broth into stuffing. Stir in 4 eggs until bread mixture is well coated. Spoon into a buttered 13-by-9-inch baking dish, and dot generously with butter. Cover with foil, and bake in a 375° oven for 25 minutes. Uncover, and bake until golden brown, 10 to 15 minutes more. To stuff inside of turkey: Put vegetable mixture and toasted bread into a bowl. Stir in 1 cup broth, the poultry seasoning, and herbs; season with salt and pepper. Stir in 3 eggs. Stuff inside of turkey and bake. So we like to stuff the turkey with dressing but also have some cook separately. Can I just follow the directions to bake it in the oven but just throw some of that into the bird? Hi Carrie – sorry for the late response…yes, you can use this for stuffing in the turkey but just make sure it cooks to a proper temperature so it is food safe. Would you be able to bake this at 350 once prepared? I have two ovens, but neither will be set to 375 – eek! Yes! Just extend the time for a little bit. Should be good! week. Think I can just bake it in one large foil pan? Maybe increase the cooking time as it’ll be thicker? Yeah, I think you could double in a large aluminum pan and increase the time. Good luck! Glad you loved it! I have made this stuffing the last two years and my family LOVES it! They liked stuffing before but never like this! Thank you for all the wonderful recipes you post. We love them! This was an amazing recipe!! My family loved it. Not too soggy & not too dry. Thank you!! Has anyone tried fresh sage, rosemary and thyme ? I have them growing in my garden but don’t know how much to use. I’m curious about the eggs in this recipe. I grew up on delicious MUSHY stuffing scooped out of the turkey but eggs were never involved. Our stuffing was/is nice and sticky so the eggs wouldn’t be needed for binding….what exactly is the purpose of the eggs? (I’m imagining bread pudding?) Other than the eggs, our recipes are quite similar…I’m excited to try my own bread for the cubes this year! Hey Sandra – the eggs give it a richer texture and help with binding the mixture together but there are many commenters who have left out the eggs (and increased the broth as needed). Thank you for this recipe! Worth all the time to make. I used your artisan bread recipe and it was the best stuffing ever! Thank you for this recipe! Worth all the time to make. I used your artisan bread recipe and it was best stuffing ever! I helped my daughter make this recipe for Thanksgiving and my family just went on and on about the stuffing! We just used a loaf of white bakery bread without a thick crust and no eggs. Just didn’t think eggs belonged in stuffing. But the best part was I made your crockpot turkey breast and gravy and added the turkey broth to the stuffing instead of making it into gravy. I think that is what made it the best stuffing ever! Your recipes are so trustworthy that I made 2 recipes for the first time on Thanksgiving day. Thank you! You’re awesome! Hope your Thanksgiving was grand! LOVED this recipe! I felt pressure to make my mother-in-laws stuffing this thanksgiving but wanted something a little different. The flavor in this stuffing was perfect. I did tweak the amount of liquid added which is totally based on preference. Thank you Mel! I have never commented on your site before but I love your recipes! Definitely my go-to site!!! 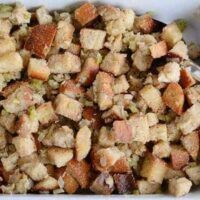 I’ll be using your “2 hour turkey” recipe this year and wanted to know if I should stuff the turkey using this stuffing recipe or cook them separately? Also is there a way to get a crispy skin on the turkey? I’ve never stuffed the turkey to roast this way – I don’t think it’s recommended for a turkey like this that cooks so quickly because there could be food safety issues if the stuffing doesn’t reach the right temperature. In the recipe it says to preheat at 350° but bake at 375°. Is that correct? If so, why does the temp of preheat make a difference? The 350 temp is for browning the bread ahead of time. The prepared stuffing bakes at 375 degrees. I can’t remember if anyone else tried it in the slow cooker but I haven’t myself so I’m can’t tell you how it will work out for sure. You could bake it ahead of time and reheat it for 15-20 minutes (while the other dishes rest) if you are out of oven space. Thank you for the dressing/stuffing recipe. I gave up on making my grandma’s and mother’s dressing after it turned out no better than the boxed stuff. My mother died when I was 29, so I only had her written recipe to go by. Well, you filled in the blanks, with your recipe, and this is the first year since 1979 it tasted like home here. I used my mom’s ingredients plus yours and your technique, and it was as close as I ever hope to come. My family used milk for the moistening ingredient, so it is a gooey-er dressing, but that’s what we’ve been missing. Apparently, there are “bread pudding style” dressings, and the crouton, drier types. By combining some of yours and most of my grandma’s, we went back in time to the old tastes. My husband (of 42 years) was wild about it, too. Thank you so much! Baking it gives a crispy top, so it is not soggy. I can’t wait to try your stuffing this year (also making your bribed turkey and gravy :). One question – I noticed quite a range of broth in the ingredients list. Do you usually end up using the full 2c.? What consistency should I be looking for in that step? Thanks so much!!! Lissi – I don’t like really soggy bread/stuffing, so I don’t use the full amount. It really depends on how moist you like your stuffing. If you like it traditionally most, you probably want all 2 cups – if you like it a bit more crispy on top and soft in the middle, I’d shoot for 1 1/2 cups or so. Jessica – hmmm, that’s not necessarily true about the bread, at least what I know. There are many artisan loaves that aren’t sourdough. I’ve never used sourdough for this stuffing. I’m sure it will work just fine but you’ll definitely get the strong taste of sourdough in the stuffing. I use more of a rustic, Italian loaf. I made this last year and I loved it but the family request was that it be more “mushy”. Any idea how I would accomplish this still using your recipe? And can this be a make ahead? Marci – simply add more broth to the stuffing to make it softer (we prefer a crunchier less soggy stuffing) – that should work great. I always toast the bread cubes and saute the aromatics the night before and then throw it all together the morning of. Good luck! Do you think I can use your recipe for rustic crusty bread for this stuffing? It’s so easy to make that i would rather do that but I want to make sure it’s the right texture. WOW, this is good stuff! Used all organic ingredients and made artisan loafs from scratch for the bread cubes. Followed recipe exactly and stuffing came out perfectly: made 1 batch for inside turkey and cooked 1 batch in a pan. Thank you for the recipe!! Rebecca – if you are worried about liquid, you can decrease by one egg or even decrease the broth. Stuffing is all about texture (I hate sogginess, too) so it can really be tailored to how you like it. I also probably err on overbaking it so it gets nice and crispy on top. Hi Mel, I will be making this stuffing for Thanksgiving once again. Last year was the first time I tried this recipe. I can honestly say this is the best stuffing I have ever made, my family all agreed. Thank you for another great recipe. When I prepared this I did not veer from the recipe. Those of you trying for the first time will not regret. Getting ready to make this tomorrow and it just seems like alot of liquid btwn the 2cups of broth and 4 eggs. You promise this is not soggy? This looks delicious; thanks for sharing. I’ve made my scratch stuffing for 20 years (DOES NOT INCLUDE EGGS). I assemble it all the night before in a casserole dish – ready to bake when the turkey is resting! Flavors have a chance to marry. 🙂 I don’t see why the eggs would make a difference. Rebecca – I’ve only ever made it the day of. I meant bake not back. Can you prep this the day before, cover, refrig and then back on Thanksgiving? Or is it best to do it day of? Melanie, thanks! I found some nice Italian loaves at Costco that I am cutting up now. To Elyse, my mom also stuffed the turkey. Her trick was to stick it in the oven after pulling it out to crisp the top a bit. My two comments: Make sure you can check the temp of the stuffing and not serve it until the turkey juice is fully cooked. One easy-ish way to not dry out your turkey waiting for the stuffing to be a safe temp is to put the stuffing in cheesecloth before stuffing in the bird. That way you can yank it out fast and not miss any, and can pull it out when the turkey is done, rather than when the stuffing is done. Then you can finish baking the stuffing while the turkey rests. In my experience, the stuffing can take a good hour past when the turkey is done to be safe, depending how large the turkey itself is. If you leave it in the bird that whole time, the turkey will turn out overly dry usually. Good luck! Melanie- I was wondering about the consistency of how your stuffing turns out… I know you like it crunchy, but you also commented that you can make it rather mushy as well. I want to fill the turkey with the stuffing, but want it to stay more on the crunchy side, and I’m afraid it will be mushy with the addition of eggs. Do you have any recommendations? Thanks! Elyse – I think it is nearly impossible to keep stuffing crisp and crunchy if you are stuffing it inside of the turkey. I’m not an expert on that matter since I only ever cook it in a separate pan, but that’s what I’ve heard. If you are determined to stuff the turkey, I’d probably omit the eggs or just decrease to one egg. Good luck! Melanie, do you have a particular bread recipe you use for this stuffing? If I don’t have a dutch oven, how hard will it be to make a thick, crusty loaf good for stuffing? 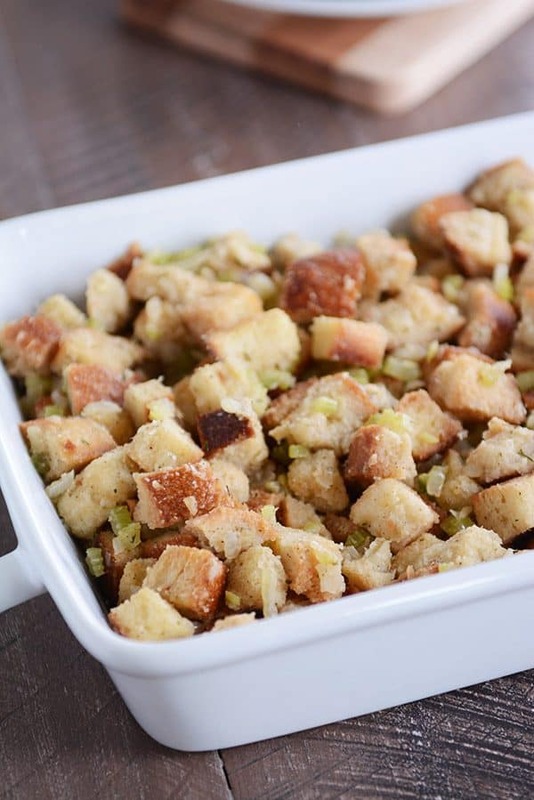 I usually to cornbread stuffing, but feel like I want something less crumbly this time. Thanks! Anne – I’ve used the Ciabatta bread recipe and also this French bread recipe before. I’ve also used this no-knead bread but you need a cast iron pot to bake it in, which it sounds like you may not have. The ciabatta and french bread don’t necessarily produce a thick, crust but because the bread cubes are toasted first, they both work out well in the stuffing in my opinion. I’ve also found a great local bakery with beautiful artisan loaves with the classic thick crust. It is a versatile recipe so I think a variety of different breads could work out well. Mel, can you tell me if I can use a poultry seasoning blend instead of the separate herbs for the stuffing? Thanks for all the great recipes! Jody – I’ve never subbed poultry seasoning for the spices but it’s worth a try. I know each brand of poultry seasoning is slightly different so you’ll want to use one you are familiar with and that you like the flavor of. I tried this out for Christmas dinner. Yummy. I hate mushy stuffing too, but that is the only way my husband has ever eaten it (as is the English way). I compromised by putting in 1 cup of broth and it was perfect for me. He was skeptical, but soon came around. Thanks for another great recipe, Mel! Annette – I love you for loving non-mushy stuffing but am glad you found a compromise with your husband! Thanks for getting back to me! I do live in an extremely humid climate right now, so that is good to know. Thanks again for the help! I love your site. I too am trying to make my own “best recipes” list for my family, so your website has been like an answered prayer. I know this is an ignorant question, but it could possibly be my first cooking thanksgiving this year: If you toast the bread the night before, do you leave it on the counter and let it keep drying, or do you store it in a ziploc? Lisa – when I toast the bread the night before, I let it cool to room temp and then store it in a ziploc bag or a bowl covered with plastic wrap. If you live in a really humid climate, it might soften up overnight. You can either use it as is or retoast it for a few minutes. This stuffing turned out wonderful! I made the traditional kind just to keep everyone happy, but this one is gone, and I have a pan full of the other left over. As you can tell, we had a MKC Thanksgiving at our house and everything turned out PERFECT! Thank you so much! Hey Liz, SO glad you and everyone else loved this! This stuffing was just perfect! Everyone loved it. I had never made stuffing before today. I knew I couldn’t go wrong with one of your recipes. Thanks -Liz K.
Looks delicious! I love your addition of rosemary. this is so similar to my mom’s stuffing, although she adds crumbled sausage which I love, you should try it. You just might save my life this year! I’ve never had to cook Thanksgiving dinner as we’ve always lived near family so went there instead. We recently moved out of state and don’t have any family here. We decided to invite a few families from church that also have no family here and I’m mentally freaking out! Thanks for doing this, I’m probably going to use EVERY recipe! If you have any tips on how to plan out your cooking schedule PLEASE feel free to share them! ;0)Thanks a ton! Jelli Bean – I added a line above the recipe stating this makes a 9X13-inch pan of stuffing. I’m guessing that would serve about 8 people. Hey Kali – great minds think (and cook) alike! Daniel and Kari Tandberg – Does your husband like margarine? I don’t use butter and margarine interchangeably so I don’t know how margarine would taste, but it would be worth a shot! Anne – I think you could probably use a baguette but your stuffing will probably be on the ultra crusty, tough end due to the baguette not having much crumb. You want to try to find something thick and hearty, yes. Really, I’m sure it will work with whatever bread is your preference, but a really rustic, artisan-type bread works best. This looks so wonderful, I am going to try it too! Another question about the bread, not a baguette, right? Something thick and hearty? Julie (and others who are wondering) – I’ve edited the recipe to include alternatives to the rustic bread. Basically rustic bread is like an artisan or crusty loaf of bread. 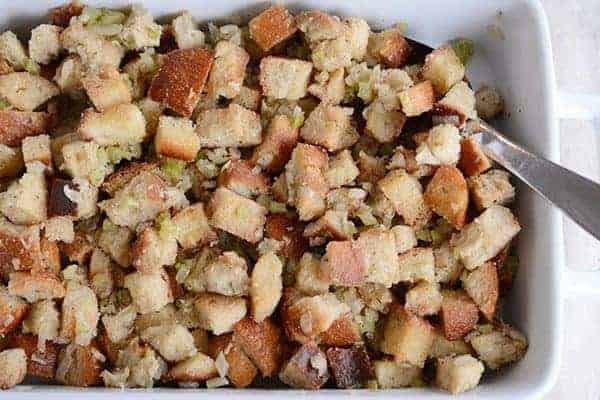 You want to avoid the soft, fluffy loaves of french bread because the bread cubes have a tendency to disintegrate and “melt away” in the stuffing. Use a really hearty, crusty loaf of bread. I hope that helps! 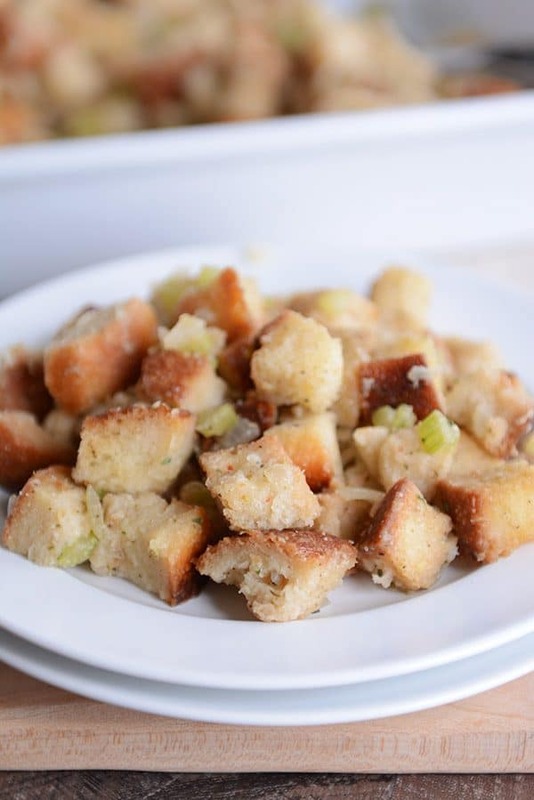 I love the idea of making your own bread cubes for the stuffing. We love our very, very moist stuffing, well seasoned and moistened with bacon and chicken stock. I’ve tried making other varieties–cornbread, sausage, chestnut–but always return to mom’s tried and true. I think I’ll use the fresh cubes this year, though, so thanks for reminding me of what really tastes great. Stuffing is one of the dishes that I look forward to at Thanksgiving, because I don’t usually have it any other time. Yum, yum, yum. Great recipe. guess what–i’ve never had homemade stuffing. it’s always been stove top at our house, so i suppose i just don’t know what i’m missing! This looks delicious! I love stuffing. I am definitly going to try this recipe this year. What do you mean by “rustic bread”? There is something wrong with my husband because he hates the taste of butter. I love it! Nonetheless, I would love to make this recipe but I am afraid he would detect the butter. Do you have any suggestions? Can I substitute some of the butter with something else? Thanks for all the tips I’m looking forward to seeing some of your other recipes even though I’m not preparing it this year. I will probably put them in my memory bank for years to come. Could you put approximate serving yields on your recipes? That would be very helpful. Thank you for posting all these helpful recipes and tips. I´m making Thanksgiving dinner for 12 people this year (my 2nd year ever) and it has been a few years since last I cooked and the recipes are gone now. As long as yours do not include anything hard to fetch at the grocery here in Costa Rica and are not too pricey, I will probably use each and every one of your dishes. Promise to blog it with links if that happens. Thanks again!